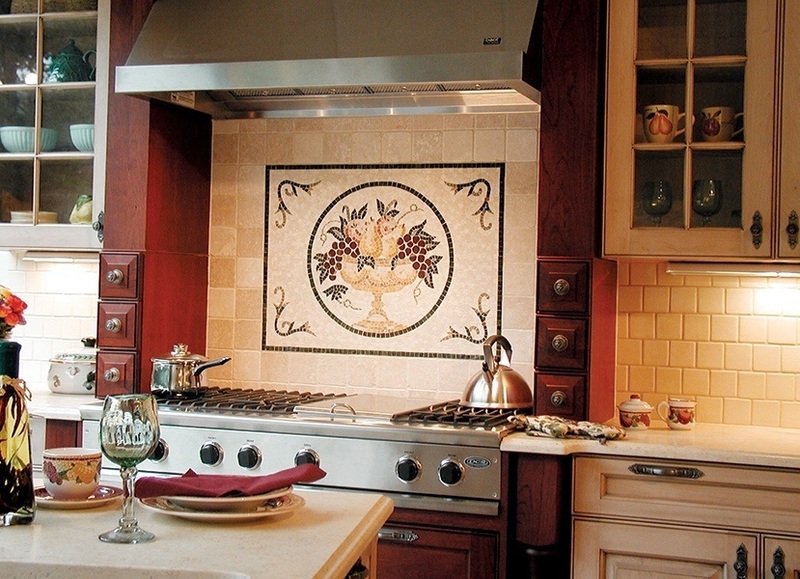 One of the most classic tile designs involves kitchen fruit tiles. Artistic designs of fruit and fruit bowls go way back, even to ancient Egypt. The act of having a fruit bowl either as a painted image or an actual fruit bowl was meant to indicate wealth and abundance. It represented the fertility of the earth and the status of the homeowner. It also acted as a celebration of life and the harvest. This particular motif is particularly appropriate for the kitchen and can provide a stunning backdrop to a large cooking range. Take a look at the way you can incorporate a fruit design into your next kitchen remodel with these 8 excellent examples. 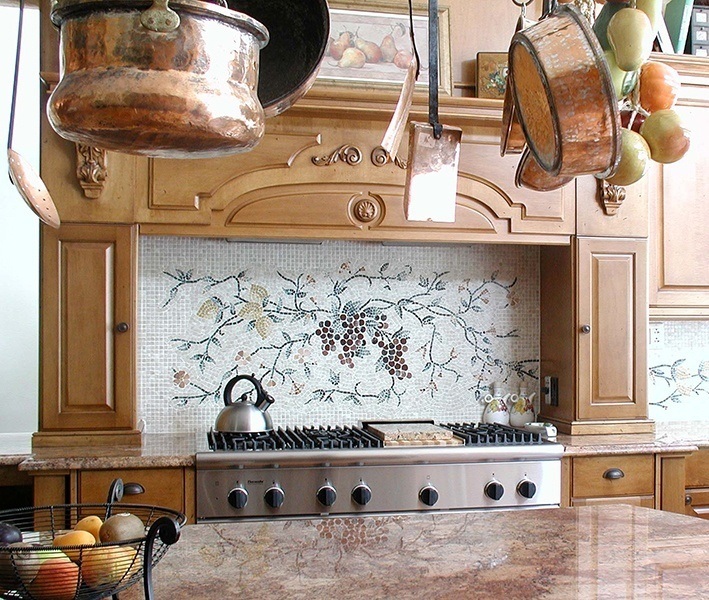 Fruit designs are made from hand painted tiles and stone murals. 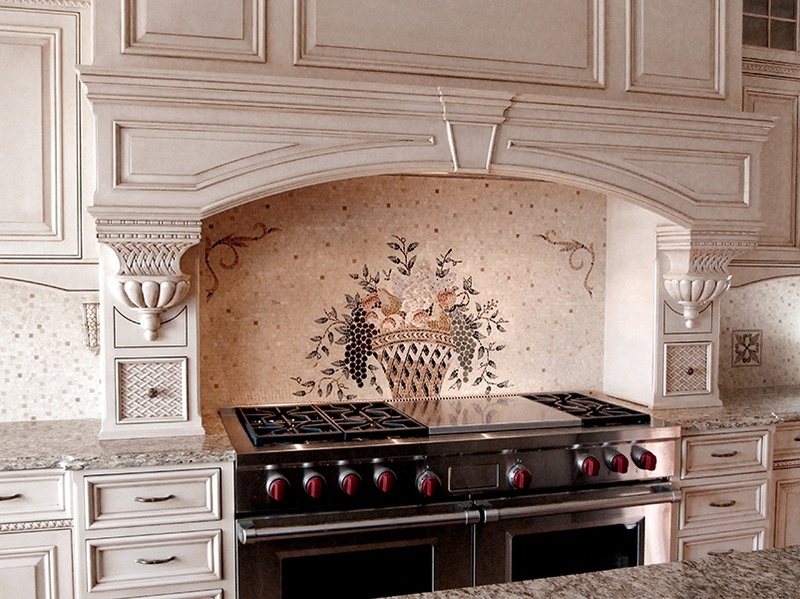 With hand painted stone, you can get a variety of different fruit designs. 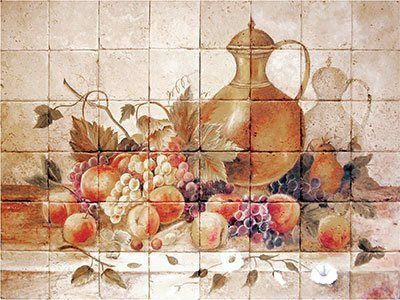 In the Baquette collection, you can see designs with fruits laid out on the table with wine carafes, like in this Adi tile design. Or, you can opt for a more traditional fruit bowl in the Merrit tile design. There are loaves of bread, flowers, and even modern wine bottles in this design collection. If you just want a floating fruit mural, take a look at this Agate fruit mosaic. Against a backdrop of off white stone tiles, it looks almost modern in appearance. Just because a fruit bowl is traditional, there is no reason you can't reinterpret the design and upgrade it to make it more contemporary. Floating it gives it an ethereal look and the white stone makes the perfect foil for this type of fantasy fruit bowl. 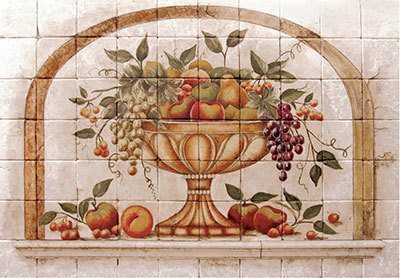 If floating a fruit basket in your kitchen is a bit unnerving, go with the classic standing fruit bowl, as in this Cucina Amavel mural. The placement of the mural makes it seem like the fruit bowl is perched atop the steel back burner cover. This would be a permanent work of art in your kitchen. To make the fruit bowl mural really stand out, try giving it a border. 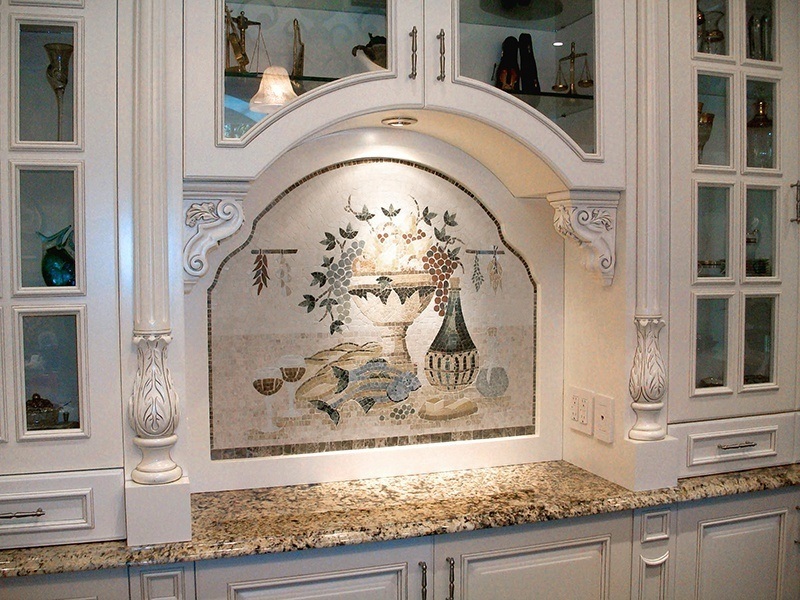 A border works well in the kitchen when the mural is in a space that is not conventionally square or rectangular. It highlights the additional workmanship of the cabinets and really makes the mural stand out. Also, the fact that it is floating in mid air, but bordered, accentuates the mural without making it look too much like a painting. And, it now feels more grounded and less ghostly an apparition. If you want to go for the framed artwork look, as in a museum painting, than frame the mural in a rectangular border, like in this Cucina Prone mural. You can choose a simple border or get as ornate as you want with even sculptural or 3-D border tile to add some sense of touch to it as well. Think about the frames you might see in a museum and try to imitate the ones you like with stone tiles. If you want a less tidy look, go for the sprawling fruit bowl. 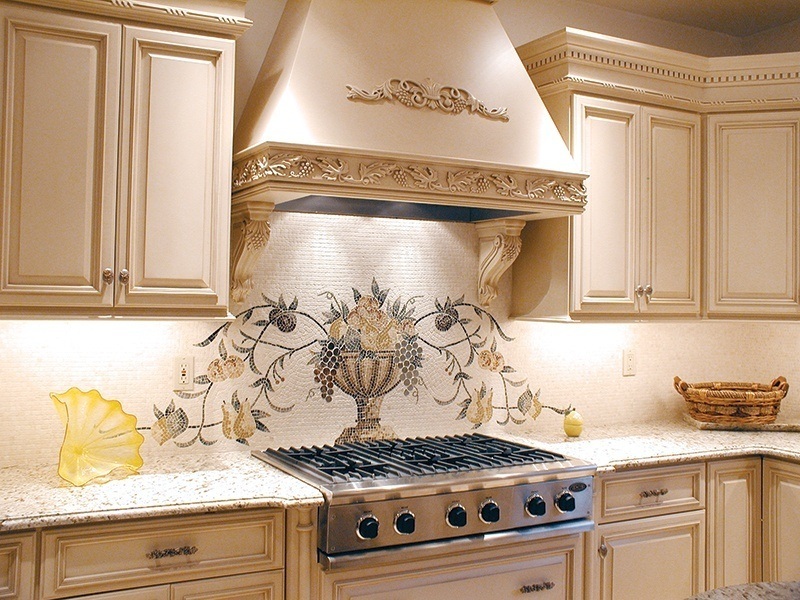 The tendrils can go as far as you want to encompass not only the kitchen backsplash, but also above the adjoining counter top. Imagine this design throughout the entire kitchen, with adjoining fruit bowls reaching out to each other. You could even have fruit placed on the counter top at different intervals with the stems reaching out into other areas and subsequently connecting with each other. It would be quite delightful to people wondering where the next grapevine might pop up and produce fruit. Add a sculptural effect to mural by choosing to inset it into the frame or border. This is a very subtle look, but incredibly elegant. 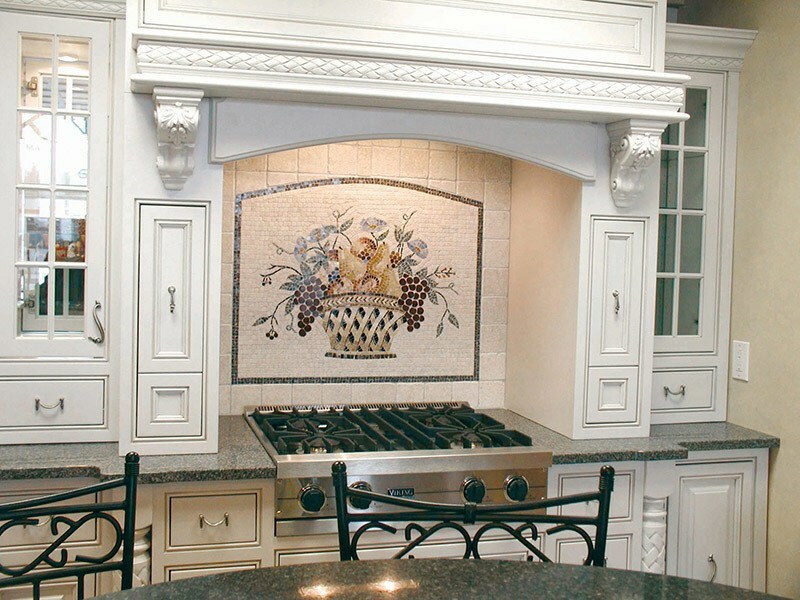 You can even used etched tiles in the surround to accentuate the sculptural aspect of this type of kitchen design. In this design, the mural is inset so that the border has a chiseled effect on the outer edges. Finally, if you want to lose the fruit bowl all together, take a look at this grape design with no fruit bowl. It can be as tidy or as sprawling as you want to make it. Consider framing or bordering it too for added visual design. In the same way you could use the sprawling fruit bowl above the counter tops, the flowing grapes can cover more than just the stove top. Have fun with this design pattern in unexpected places, like above the doorway in a kitchen or along window edges. There really is no hard and fast rule that says a fruit tile can only go above a stove or counter top. So, let your imagination free and do them anywhere you want. Kitchen fruit tiles are fun to admire and work with because they can be innovated into newer designs or put in unexpected places. However, just a classic fruit bowl can invoke good vibes by having a constant reminder of wealth and abundance in your home. It is such a classic design that continues to be popular with homeowners now as much as it was in the past with the classical Greeks and Romans. Don't just limit yourself to a standing fruit bowl. Try floating one or framing it. Experiment with borders and frames, and you can create fruit bowl designs that are uniquely your own, too. Go wild with fruit tiles and put them in unexpected places or let them flow beyond their borders. Can you imagine one of these scrumptious collections of fruit in your kitchen? 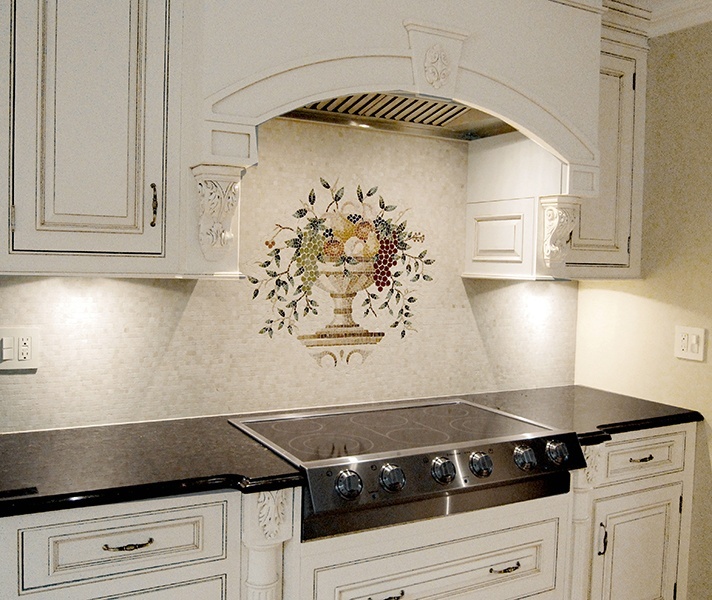 Comment below and let us know how you might use a fruit tile design in your next kitchen remodel.